Mayor Nutter & Lt. Gov. Candidate Mike Stack Call for Action on School Funding. Lt. Gov. 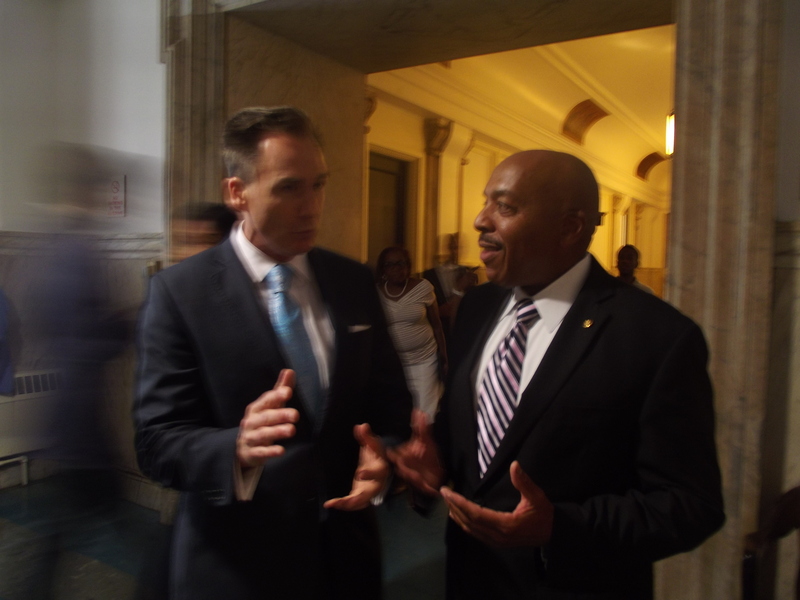 Candidate Mike Stack and Rep. Ron Waters (D-191) at City Council discuss school funding. 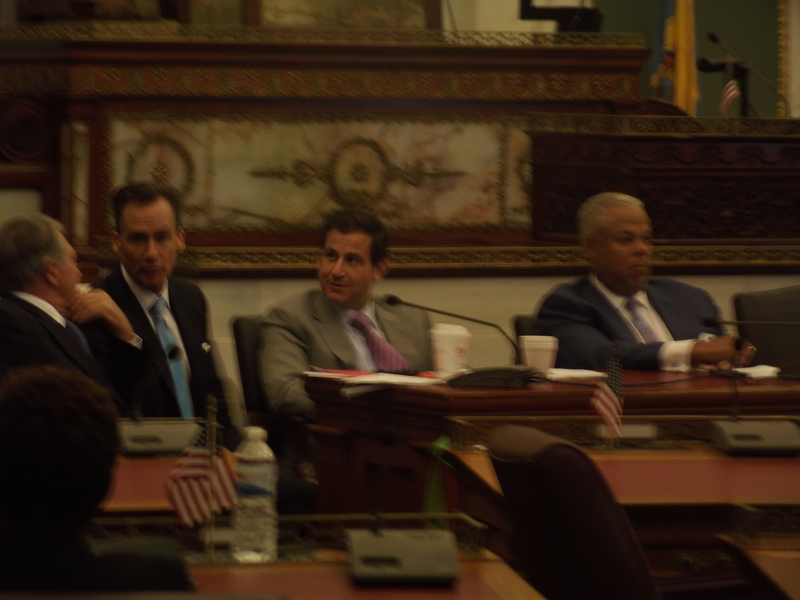 Philadelphia – With a looming likelihood of hundreds of layoffs, delayed openings and further swelling classrooms, Mayor Michael Nutter, Public Schools Superintendent William Hite and a coterie of Philadelphia – area State Senators met in City Council chambers, Wednesday, looking to give impetus and a sense of urgency to pending legislation that would enable Philadelphia to tax local cigarettes sales. The $2 tax is expected to generate up to $83 million annually to cover a shortfall in the public school budget..
“Talk is cheap, we need action and action for years to come,” said State Sen. Michael Stack, a candidate for Lt. Governor, expressing the need for a “long-term” funding formula for public schools, a sentiment echoed by Senate colleagues, Sens. Anthony H. Williams and Vince Hughes. After referring to a sister who teaches in the Philadelphia Public Schools and mother who was once a member of the Philadelphia School Board, Sen Stack denounced a process that compels Mayor Nutter and generations of earlier mayors to go to Harrisburg, “hat-in-hand to beg” for funds.. Meanwhile, a Republican House leadership, that had initially indicated its intention of bringing a proposed $2 per-pack cigarette tax to a vote on August 4th, was again scuttling a scheduled vote on the measure to bolster the finances of Philadelphia schools.. Both Mr. Hite and Mayor Nutter also argued that the district is operating with “more efficiency,” citing a reduction of 5,000 employees, reduced costs, closed schools and obtaining labor concessions as evidence of the improved fiscal stewardship. “If you want to reduce crime, you want to reduce violence, you want to reduce drug dependencies,” then support education and the cigarette tax, said Sen. Wozniak..
via A Latino Search for a University A Light in the Window at Pen. 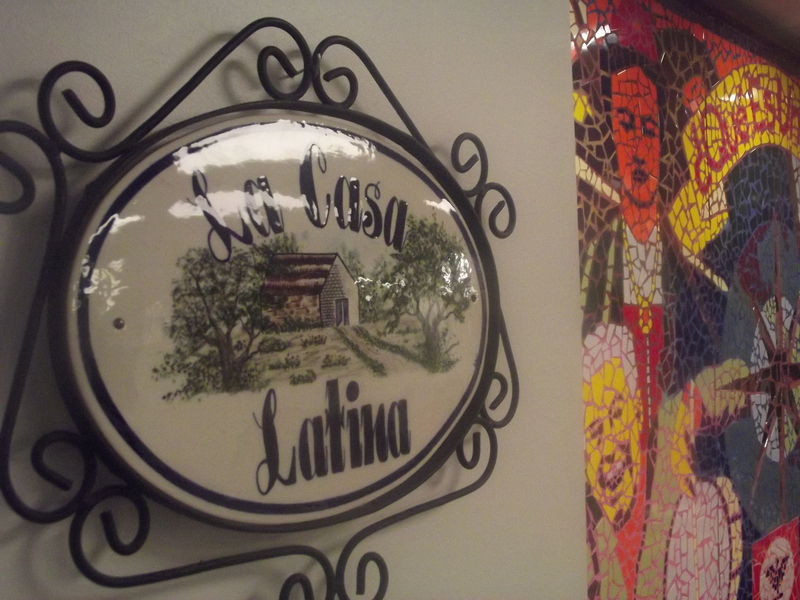 Philadelphia – When the Garcia family walked into the offices of La Casa Latina: Center for Hispanic Excellence on the campus of the University of Pennsylvania, Monday, they were taking the first steps in a search that hundreds of thousands of other families are undertaking at this time of year. Is this the right University for my son or daughter? This particular Dominican family from Chicago, Ill. was fortunate in having a Philadelphia friend, Radio commentator Pedro Rodriguez, who steered them to La Casa Latina, where Director Johnny Irizarry has been a light in the window for Penn’s Latino students for nearly a decade. A background that includes political and community activism, a teacher and member of the city’s School Reform Commission, and co-founder of some of Philadelphia’s prominent Latino arts and educational institutions, Johnny Irizarry brings not only organizational skills, but the type of broad experience and knowledge that make him a valued counselor and a touchstone for students. “But Penn has an amazing amount of resources, academic resources for students, mentorship programs and freshman programs” designed for students who might be struggling,” said Irizarry. “It takes time to adjust,” to college level academics and a new environment. “Everybody looks like they’ve got their act together, but they all go through the same thing,” added Irizarry. “The important thing is to speak up. You shouldn’t drown by yourself. Penn has so many support systems,” he said, gesturing behind him to a wall of nearly two dozen banners indicating various Latino organizations at Penn. Discussing Penn’s efforts at diversity, Irizarry cited the incoming 2,500 freshman class, of which the number of Latinos is between eight and nine percent. By comparison, Temple University, which has made efforts to attract Latinos has averaged only 3 to 4 percent of Latinos among its student population. In praising the work of Penn’s admissions department, Irizarry described its holistic approach in evaluating applications to the Ivy League school founded by Ben Franklin in the late 1740s. On the subject of choosing a major, Mr. Irizarry stressed that it’s often susceptible to change and that students should be open to that potential. “There are parents who say, ‘you are going to be a doctor or a lawyer,’” but a student may be pulled in a different direction. In regards to Nick Garcia’s interest in business and finance, Irizarry specifically referred to the University’s Huntsman program, a dual major program in which students eventually earn a BS in Economics from Wharton and a BA in International Studies from Penn’s School of Arts and Sciences. A popular program in an increasingly global economy, the program has attracted distinguished guest lectures from such figures as, Robert Zoelick, the President of the World Bank, and former Mexican Secretary of Finance Ernesto Cordero. “Everybody that’s in it, loves it,” said Irizarry. Opened by Franklin to support the education of working-class Philadelphians, the Univ. of Penn of 2014 attracts students who have SAT Composite scores of from 1350 to 1540; and annual tuition costs $43,738 and total annual costs of more than $59,000. Among the top ten research universities in the nation on every survey, Penn has more than 24,000 students and a little over 11,000 undergraduates. Of the other northeastern colleges and universities, Princeton in nearby Princeton, NJ is comparable both academically and as to cost. Also a top research university, Princeton was similarly chartered in the mid 1740s, and has a faculty which boasts a dozen Nobel prize recipients. The SAT scores of its students are slightly higher than Penn’s, (1410 to 1590), but Princeton is also smaller, having only 5,203 undergraduates, and its annual costs are slightly less at $54,700.